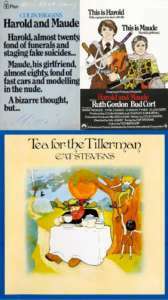 This section has been created to debate the connection (not always happy) between literature and cinema, by discussing films based on some literature’s masterpieces. 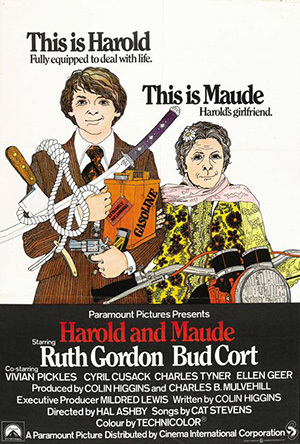 Herein, in this particular category, “Harold and Maude” (a 1971 film directed by Hal Hashby, starring Ruth Gordon and the unknown Bud Cort) represents a little miracle. This is because, contrary to what normally happens, the film version manages to even be better than the book that inspired it. 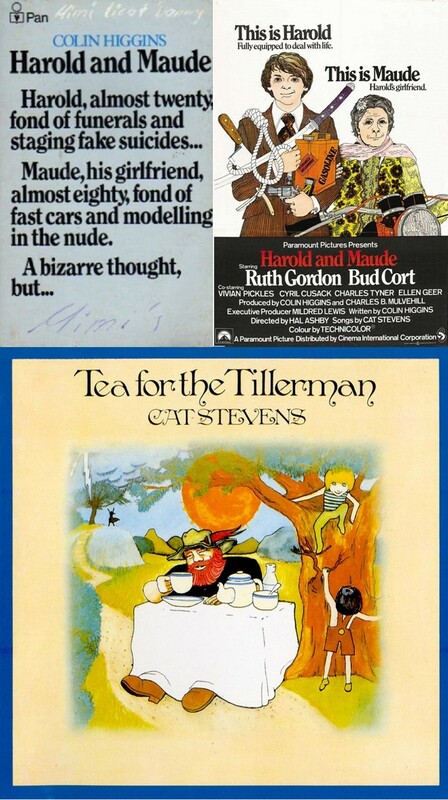 “Harold and Maude”, that in the glorious seventies was a real cult, lay on very solid foundations such as a superfine script, a lively direction, a pair of actors that play the roles perfectly, and, last but not least, a soundtrack by Cat Stevens, exquisitely accompanying the sequence of images. Short note: The book, written by Colin Higgins and first published by Lippincott in 1971, sold out almost immediately. I can remember that, near the end of the 70’s, I came across a pile of copies in a Remainders library, where out-of-print books were sold at bargain prices: I bought all those I could scrape together, sorting out, in that way, the tiring problem of my friends’ Christmas gifts that year. Let’s go back to the film (and the book): the story is simple, the narrative is coherent and at the same time complex considering the psychological implications of the unfolding events. Harold is an old, upper-class eighteen-year-old American boy, who’s obsessed with death: he puts on a series of fake suicides (showing a great scenic design competence) in order to hurt and destabilize his rock-like mum (because of her routinely middle-class conventions); he attends funerals of strangers; he often hangs around at cemeteries and junkyards; he loves driving hearses of which he empowers the engine; and he’s apathetic and depressed. Maude, instead, is an eighty-years-old fresh and bright teenager, anarchist, rebel, alive and kicking in everything he does. A beautiful, fascinating film – I watched it hundreds of times, and from time to time I feel the need to see it again – that made and makes one think, a useful film in a historical time when the encounter among different people, or better opposites, is considered frightening. We live in a time when people are unable to understand the great treasure that can sprout from a combination of cultures, tastes, experiences, and different flavours. Going back to the Tao, “Harold and Maude” shows how a new life can flourish from death, a life of which the main character – stuck in his cage / chrysalis of bourgeois beliefs – ignored the infinite beauty and potential.